4. Look at Source 4. 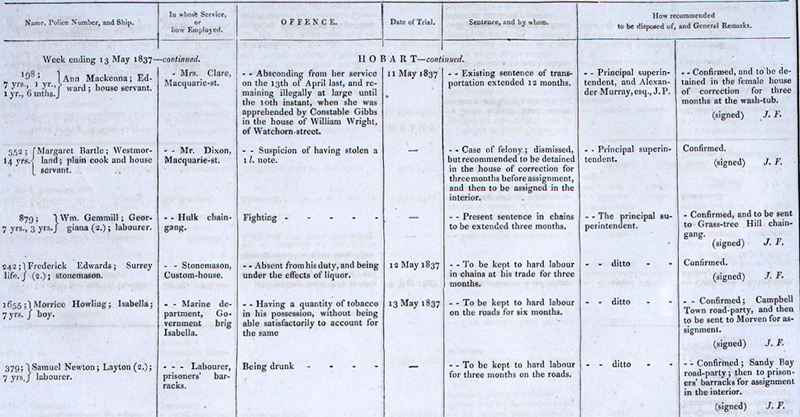 This is an extract from the discipline records for convicts shipped to Hobart in Van Diemens Land (now Tasmania). Read through the list. What kind of offences have the people been disciplined for? Look at Ann Mackenna’s record. She has more than one sentencing term. Why do you think this is? Do you think the people on this list are adults, children or a mixture or both? Why? Do you think these punishments were fair or unfair? People who were transported were usually sentenced for a fixed time, such as seven years. Do you think they were allowed to go back to Britain after this time had passed?